Now that was quite a week of cycling related business I just experienced! I am glad this is a week without a normal post, because I would not have had time at all to make an elaborate post with a video. The week started on Whit Sunday, with a presentation for an Australian delegation in Utrecht. This was a small group of influencers, brought here by the Australian Cycling Promotion Fund. It was their introduction to Dutch cycling and they had a very busy schedule ahead of them. Their one week tour was filled with visits and presentations in Utrecht, The Hague, Amsterdam, Rotterdam, Eindhoven, Houten and Brussels. 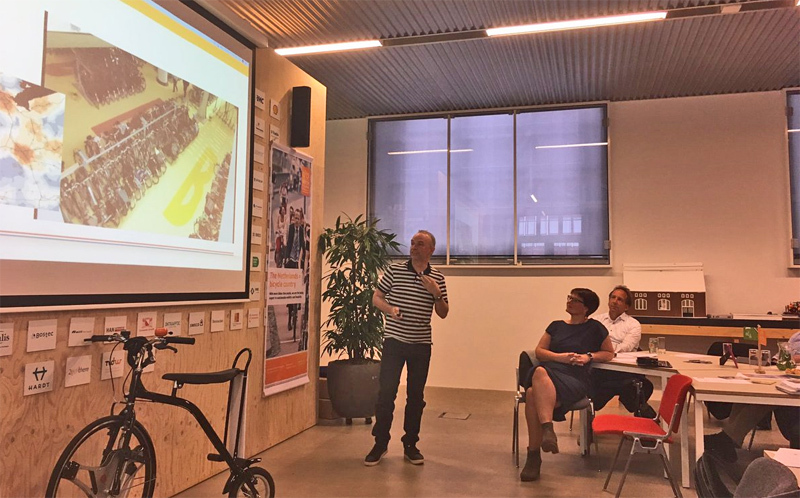 My presentation about my recent Australian Trip at the Dutch Cycling Embassy in Delft. (Picture DCE). My trip to Australia in just a few bullit points. 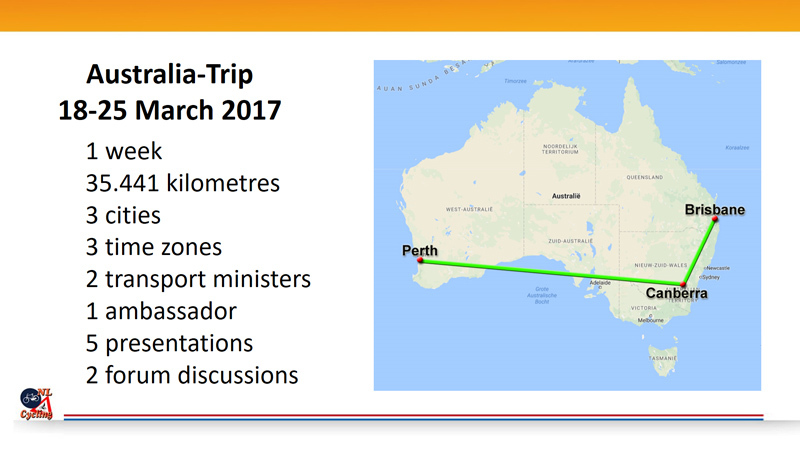 On Tuesday, I informed my fellow members of the Dutch Cycling Embassy about my recent tour of Australia in a short presentation at the DCE’s office in Delft. On that trip it was me who had a full week of presentations and visits. 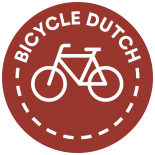 But it makes sense to do a lot when you travel halfway across the world to see about, or to tell about Dutch cycling. 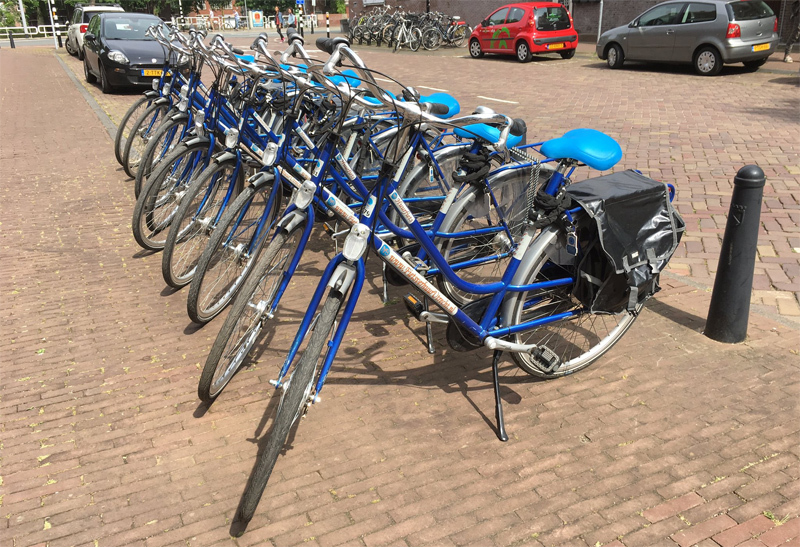 Rental bicycles for the Australian Delegation lined up in front of the headquarters of the Dutch Cyclists’ Union in Utrecht. 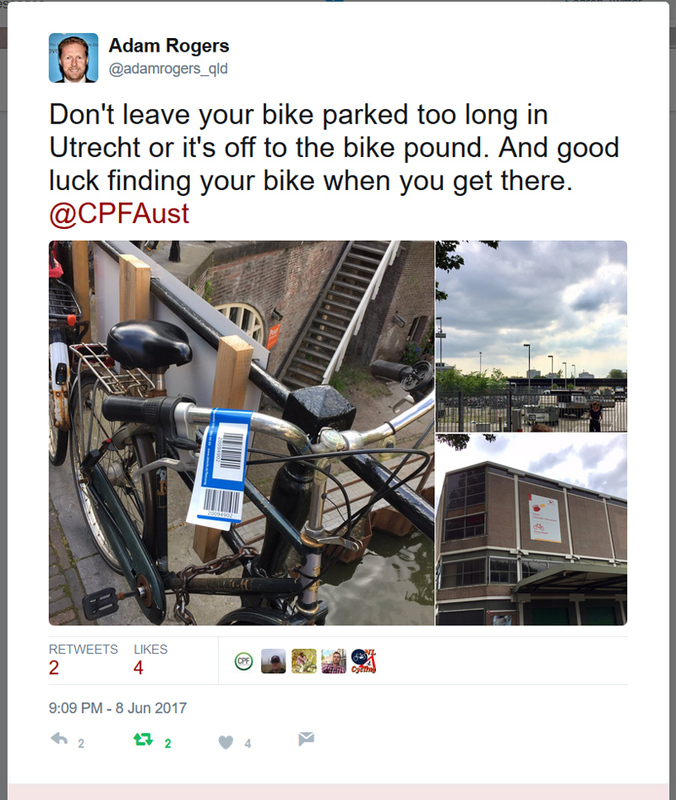 That Utrecht impounds bicycles that are parked wrong or too long made quite an impression. Tweet by Adam Rogers from Brisbane. On Thursday, I saw the Australian group again. I joined them for a presentation at the headquarters of the Dutch Cyclists’ Union and after that I gave them a tour of Utrecht. I expected it to be quite challenging in the evening rush hour, but they had cycled so much by then, that all went really well. The group blended in nicely. 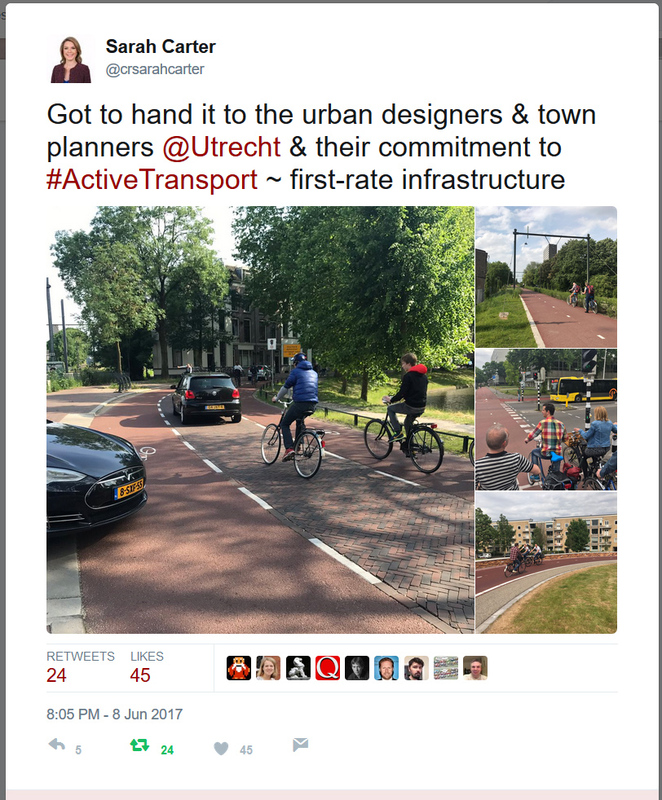 The Utrecht bicycle infrastructure was impressive to the Deputy Mayor of Maribyrnong. 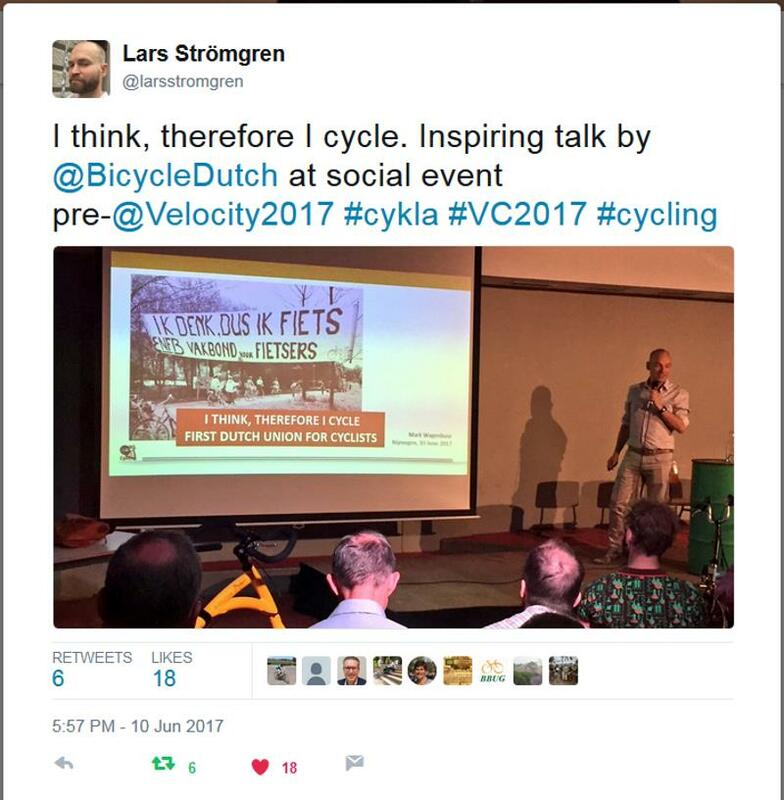 On Saturday, I was invited to speak at the social event of the European Cyclists’ Federation which was held in Nijmegen ahead of this year’s Velo-City conference in Arnhem-Nijmegen. My presentation at the social event of the European Cyclists Federation. Tweet by Lars Strömgren, vice-president of the ECF. On Sunday, I met Mark Treasure, the chair of the Cycling Embassy of Great Britain, in my hometown. 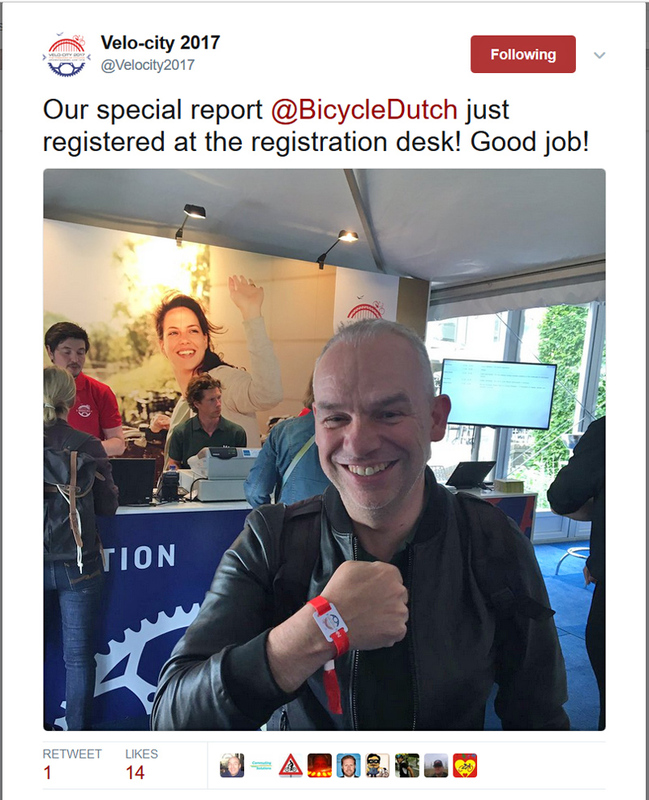 He was on his way from London to Nijmegen by bicycle (!) and he made a stop in ’s-Hertogenbosch. I walked (!) with Mark Treasure in the city centre of ‘s-Hertogenbosch to quickly show him some things that had changed since his last visit, 3 years ago. The Velo-City conference starts today, Tuesday 13 June, so many people will have another full week of cycling related activities ahead of them, including me again. You can be sure that I will write about some of the events in upcoming posts. For those of you attending, I hope you all enjoy yourselves! I was caught by the organisation at the registration on Monday. I’m from Brisbane and love to go cycling (in the Netherlands). My wife and I are looking forward to our next trip which starts tomorrow in Amsterdam. We will spend a week riding around the Markenmeer and Ijsselmeer this time. I’m still hoping that Australia will one day restore the freedom of optional helmet wearing so the demand for cycling infrastructure can also go up. I find it extremely difficult to encourage my friends and family in Australia to go on a leisurely bike ride with me due to mandatory helmet laws (I have a medical exemption certificate so I can have the option of not wearing a helmet in Queensland). What is the unusual bike with the small back wheel in the first picture? as citizen of Nijmegen I will be there. Only at the public activities. I will cenrtainly attend the bicycle parade on thursday and write an article about it in a local magazin. So you’re finally showing your face huh ;). Good to read about your going about and spreading cycling culture. Keep up the good work! How much more time until the singularity, a point where humans merge with cybernetics and Mark Wagenbuur merges with his bicycle to become really smart, immortal and with real time computer data about his quality of riding? 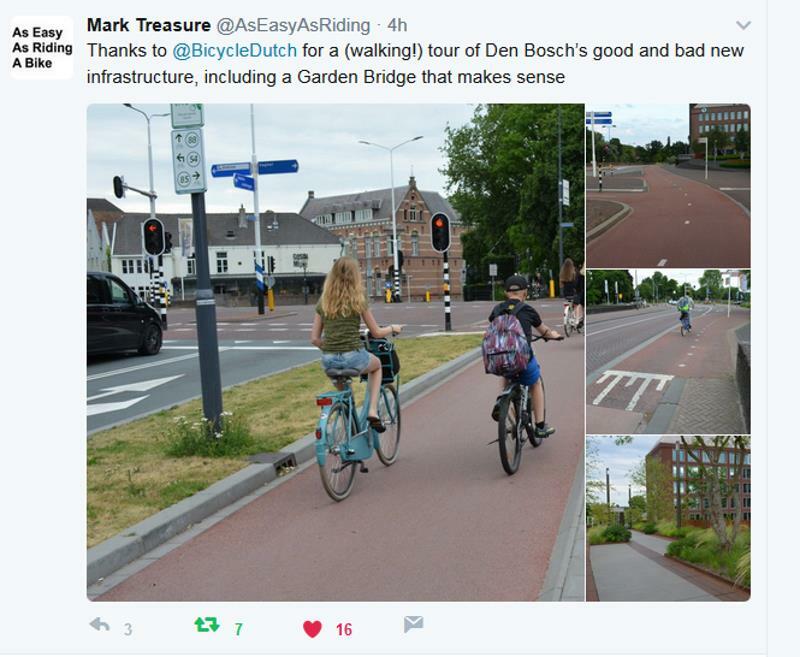 This entry was posted on 13 June 2017 by Bicycle Dutch in Original posts and tagged Australia, Nijmegen, small things, Velo-city.